I love a challenge, so every few months I challenge myself to do something different or try something new. Last year, I challenged myself to eat clean allowing zero cheat meals for 60 days. Now, to celebrate turning 25 again -wink-, I’m going vegan for 25 days starting Monday, January 22 and ending on Thursday, February 15th on the eve of my born day! Some of you may already know that I follow a pescetarian diet, and a few times out of the year I take out all animal products, dairy and eggs included. What’s the big deal about taking out a few extra food options? For me, I find that following a whole foods plant-based diet makes me a little more conscious about the things I’m allowing to into my body. I eat relatively clean for the most part, but as someone who wants to study dietetics and help others make better food choices, I myself have to become a more mindful eater. 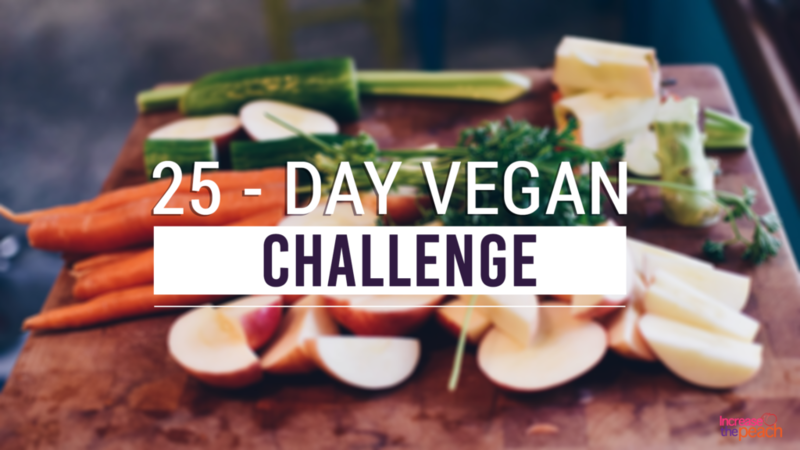 In taking this challenge with me, I hope the same will be true for you, that you’ll read ingredient labels, ask questions when dining out, know where your food comes from and rather than selecting the easy option opting to make the healthy selection. Interested in joining me? Great, I’ve put together a few things to help you take the challenge. Please leave a comment or join our Facebook Group: #IncreasethePeach if you’d like real-time updates. Keep reading to get your 25-Day Increase the Peach Vegan Challenge Meal Guide, and recipes!